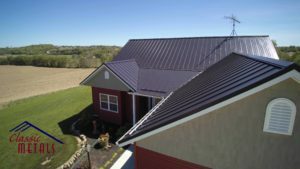 If you are considering purchasing a Standing Seam roof there are a few things that you should be aware of and watch for. 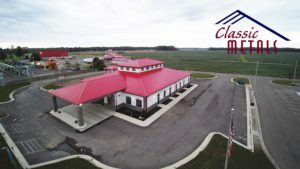 Not all Standing Seam roofing is created equal so here at Classic Metals, we strive to provide you with all the information you need to make a informed decision. The substrate that steel panels are made of, is an integral part of the product and will affect the longevity of the steel. The two most common Substrates are Galvanized and Galvalume. Galvanized is basically steel that is hot dipped in zinc, and one of the main drawbacks is that the zinc coating can easily be scratched off. Galvalume is essentially a 55% aluminum to 45% zinc alloy coated sheet steel. This blend is what makes it different than Galvanized Steel which is covered with a zinc-only coating. Galvalume Steel can be expected to provide at least TWICE the service life of traditional zinc-coatings of similar coating thickness under the same exposure conditions. This has been proven by actual exposure tests using flat coupon samples, conducted over 36 years in the U.S.A. and 15 years in Canada. These tests show that Galvalume has at least TWICE the service life versus Galvanized. When you are discussing options with your installer or steel supplier, be sure and confirm that they manufacture the trims that you will need, out of the same steel as the panels. This is a common area that suppliers can cut costs and use 29 gauge trims on a 26 gauge roof for example. This is not only a unnecessary cutting of corners, it can lead to uneven fading of trims verses panels. Oil Canning in metal roofing is not a structural problem or a cause for rejection, however most manufacture’s and installers try to avoid it if possible. Material thickness and type of material can contribute to oil canning and install procedures also play a part, but panel design and machine settings play the greatest role. At Classic Metals we pride ourselves in maintaining high quality machinery that produce panel quality that is second to none. 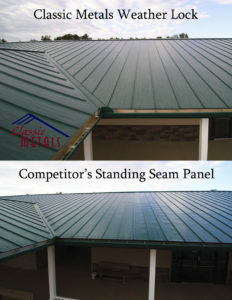 The picture of the two roofs to the right, show the difference between a panel that Classic Metals manufactured and a competitor. Both pictures were taken on buildings that were exactly the same, and less than 50 feet from each other. 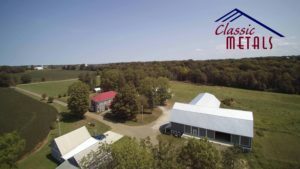 Don’t settle for a Standing Seam Roof that is less than it could be, give us a call today and we will show you the difference. 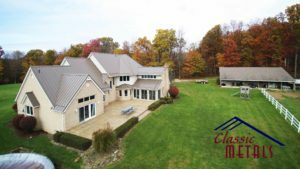 In the fall of 2017 Classic Metals received a phone call regarding some Standing Seam roofing that was needed for a richland county home. The customer was looking at several colors and options that were available and was undecided on what would be best. After some consultation with a local installer the 24 gauge 16″ wide Weatherlock Standing Seam in Medium Bronze was decided upon. 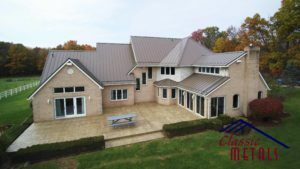 One of the unique quality’s regarding this job was the fact that the customer and the installer wanted to install the standing seam roofing directly onto the existing shingles. This required a number of custom trims to be made to accommodate the extra coverage that was needed. The design of the home also caused the roof itself to have several unique and challenging quality’s, but the installer rose to the occasion and did a great job. The 24 gauge 16″ Weatherlock panels were manufactured on the job site the morning of the installation, and everything went well and they were installed on the home over the next week. 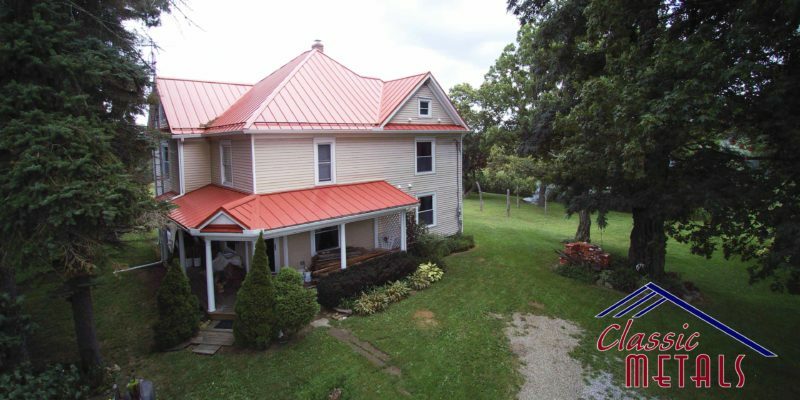 The 24 gauge material that was used comes with a 35year warranty on the paint, and a lifetime manufacture’s warranty so a roof replacement is the last thing the customer needs to worry about. 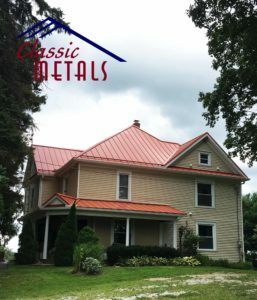 Feel free to contact Classic Metals if you have any questions or would like a quote on material for your own home or business. Few things now days last for 50 years, and the fact that something has been in the same family for over 200 years is an amazing fact. William Ewing purchased 2,000 acres near Wooster OH in 1812, and that property has remained in the family until this day. Altho there have been improvements and renovations made over the years, many of the structures remain. In the life of a farmer, the barn is a very important structure and a staple to the farmer’s way of life. The original barn that was on the Ewing property burned to the ground in 1939 because of a lightning strike. At that time the Ewing barn was the largest barn in all of Wayne County, so it was a loss of epic proportions. As was the custom in that day, everyone in the area was willing to volunteer and rebuild the structure, however, because of the cost that was involved, the barn that was rebuilt was smaller than the original one. Five years ago, the family decided to update the home that was located on the property. Among the many things that they upgraded they lifted the home, and dug a new basement under the home. They also installed a new metal roof on the home and added a lot of details to the exterior. 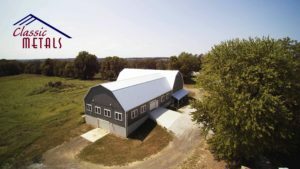 In October of 2016, the owners turned their focus to the Barn. 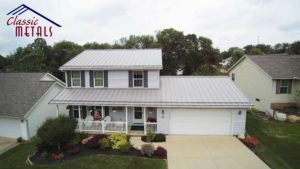 There was an addition that was added to the side, the roofing was replaced with Galvalume Standing Seam, and a number of other improvements were made. Throughout the entire prosses, the family was concerned in maintaining the timeless style that the original buildings were designed to have. 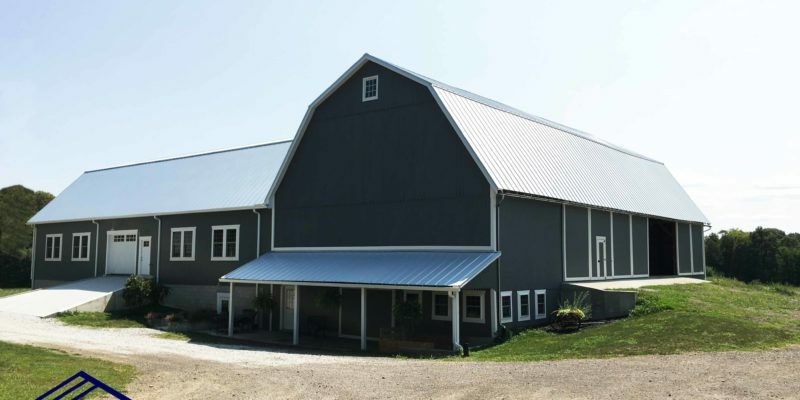 Classic Metals was privileged to be involved in manufacturing the Standing seam for the Barn On-Site, and the project went very well. 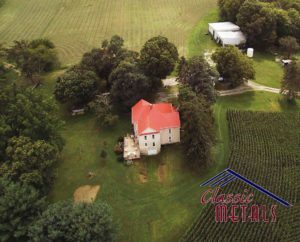 All of us here at Classic Metals and First Choice Exteriors, want to Congratulate the Ewing Family on a beautiful property and wish you all many more years of enjoyment. In this modern time of fast paced technology, and disposable products, it feels refreshing to hear about a Church / Congregation that has stood the test of time. One of those examples is the Church of Christ in Polk Oh. The current church building itself was built in 1906, however the congregation was founded by Thomas Campbell, and his son Alexander in 1840. Starting in about 1860 the congregation started regular monthly meetings, and in 1870 they decided to erect a church building. Jacob B. Fast, a carpenter from Troy Township built the church for $1,500.00 and dedicated it on February 19 1871. 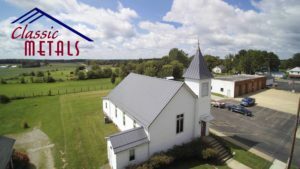 There were many hard times and good times throughout the years, and in 1890 it looked like the church might dissolve into the pages of history, however on July 28th 1897, five woman convened to form the Ladies Aid Society with a goal to secure a suitable place to hold preaching services in Polk. 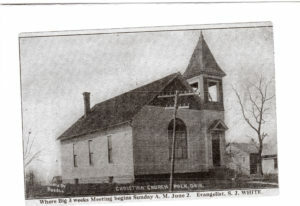 Through much determination, fundraising and hard work they raised the funds needed to build a new church building in January 1906. A few of the costs of interest that were involved were an Organ– $34.48, 8 dozen chairs–$41.56, Hymnals–$8.00, and the land for–$250.00. 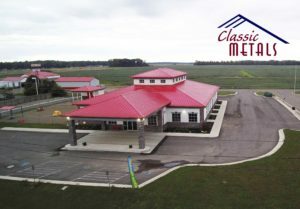 Classic Metals was contacted when the time came to replace the existing asphalt shingle roofing with a 24ga Standing seam roof. 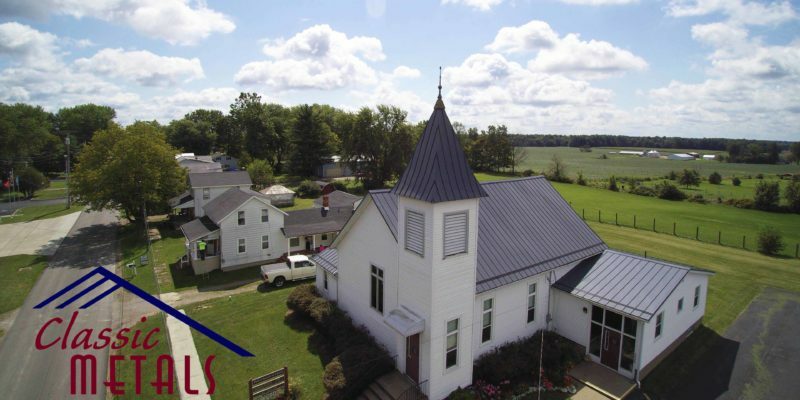 One of the challenges to the project, was the fact that the steeple roof was curved, and the question was asked if it was possible to install steel roofing in such a application. We worked with the installers to calculate the amount of curve that was needed, and then manufactured the panels in-house to those specs. A big advantage that Classic Metals was able to provide, is that the curving is done at our location, rather then shipping the material from another source. The final project came together very nicely, and the congregation of the church could not be more pleased with the final outcome. 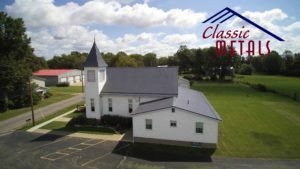 If you happen to be in the Polk Ohio area, be sure to stop by, or attend a service, and take part is a piece of history that has stood the test of time, and been in operation for over 150 years. 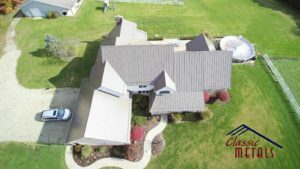 Metal roofing has made drastic improvements in design and longevity in the last 40 years, and this fact was proven once again at a job site that we visited a few weeks ago. 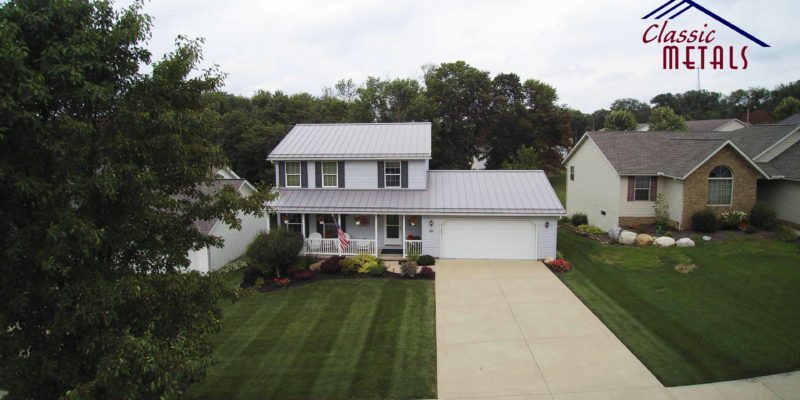 The existing roofing that was on the home of Dave and Heidi Scherpelz was Galvanized Hand Seamed Standing Seam Roofing. This type of steel roofing has yearly maintenance that is needed in order for the roof to last long term. Every year the seams need to be re-crimped and sealed with a special sealer and the roof need to be inspected for leaks. Over the years some of these steps had been neglected, and the roof was slowly deteriorating. “This home is located on a hill, and we experience very high winds on a regular basis”, the owner Heidi told me. ” I guess we did not really realize how bad the roof was, until after a hard storm, I counted 40 leaks”. 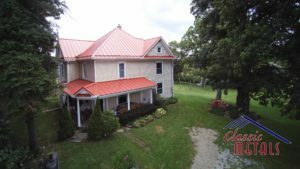 It was then that Heidi began the process of finding a roofing installer that they could trust, and began making decisions on the style and color of roof that they wanted. 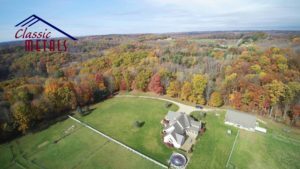 They interviewed a lot of roofing contractors and they quickly felt comfortable with Hochstedler & Sons Construction, located in Gambier Oh. “Paul from Hochstedler answered all of our questions and with the experience that they had as a company, we knew that they would do a great job”. 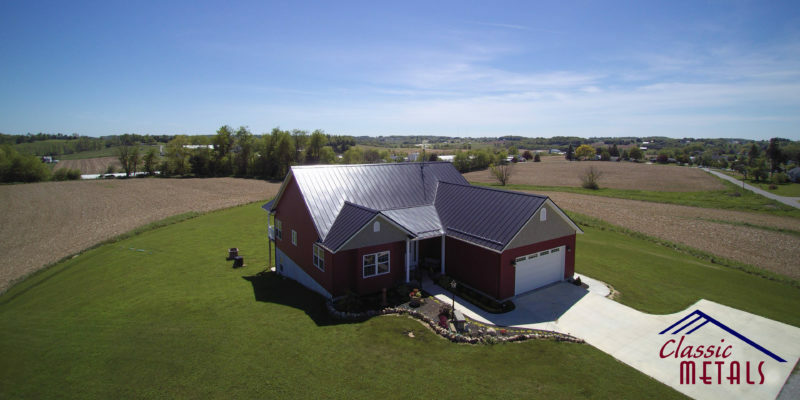 As they discussed the different options in metal roofing, Heidi pointed out that with the high winds that they receive, they needed something that would stand the test of time. The 16″ wide Weatherlock panel was decided on because of its high wind resistance, and how its appearance stayed true to the style and design that the original home builder had in mind. “Picking a color was hard” Heidi said “but that is where Google was our friend, when we wondered how a color combination would look, we searched for it on Google images, and that really helped us make our decision”. Hochstedler and Sons did a really great job on the installation, and everyone is really pleased with how it turned out. They really took their time and paid attention to the details, and that is really important for a completed job to look its best. 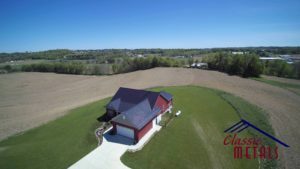 Congratulations to Dave and Heidi on a great looking home, and a roofing system that is designed in such a way, that yearly maintenance is now a thing of the past. When we take the time to evaluate the things in our life that are really important, family is definitely on the top of the list. It is for this reason that when the time comes to choose a daycare provider for our children, the decision should not be made lightly. 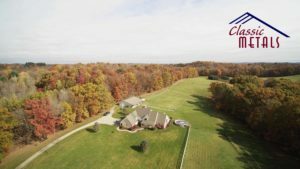 Karen’s Kids Campus is located on 63 Sportsmans Dr., Marengo, OH 43334 and specializes on providing daycare services and preschool to children ages 6 weeks to 12 years old. They are fully licensed and offer a variety of services and benefits to the surrounding areas. They specialize in Daycare, Preschool, and Before / After school care. They also can provide bus services to the highland schools which really provides another layer of convenience for everyone. The slogan that Karen’s Kid Campus operates by is ” To Teach is to Change Lives ” and everyone that is on staff, believes and operates this way. Karen’s Kids Campus began March 1st 2015 at a different location, and then moved to the current location close to Interstate 71 in early 2016. 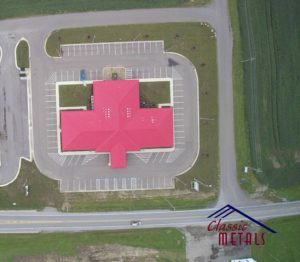 Classic Metals was involved in manufacturing the Standing Seam for the building that they are currently in and worked closely with the roofing installer. 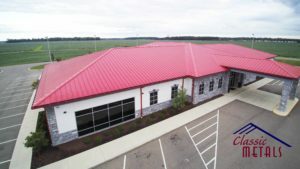 The roofing that was chosen was the weatherlock 16 inch wide panel, manufactured on-site in a 26ga custom red color and it was installed by Schwartz Quality Construction located in Marengo Oh. They did a awesome job with the install, and really took the time to insure that everything was installed correctly. If you would like more information regarding Karen’s Kid Campus you can call 419-253-7400 or visit their website. There are many choices when it comes to where we go to receive healthcare, however there are always healthcare facility’s that stand out among the rest. That decision has become a little easier to make if you live in the Marengo Ohio area. In 2013 the Morrow County Hospital at the Cardinal Center was built with the intention to provide high quality healthcare to the area. 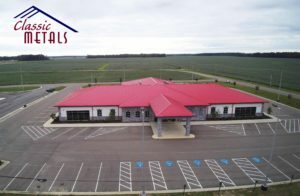 During the planning phases, the decision was made to pursue Standing Seam Roofing, however the exterior designer was looking for a bright red color that was not available as a standard color. 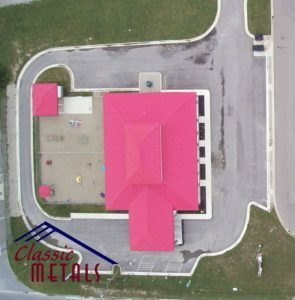 That is where Classic Metals was contacted to look at the color that was needed, and pursue the option of painting a custom color. The custom color was painted, and then later, the panels were manufactured on the jobsite by Classic Metals. 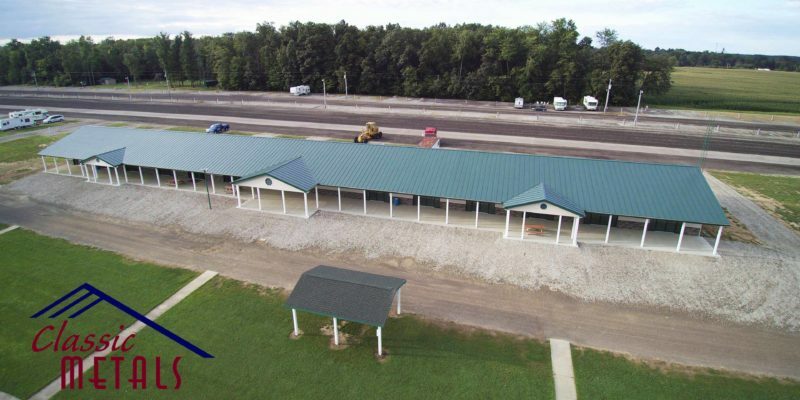 The Standing Seam Panels were installed by Schwartz Qua lity Construction, located in Marengo Ohio. Essentra Pharmacy is also located in the same building, which really helps to make filling prescriptions a breeze. At Essentra Pharmacy, they strive to have the feeling of a hometown pharmacy, while still providing the most advanced products, services, and information that is available. They also understand that time is precious, so they work efficiently to get your prescriptions ready in a quick, but safe, manner. 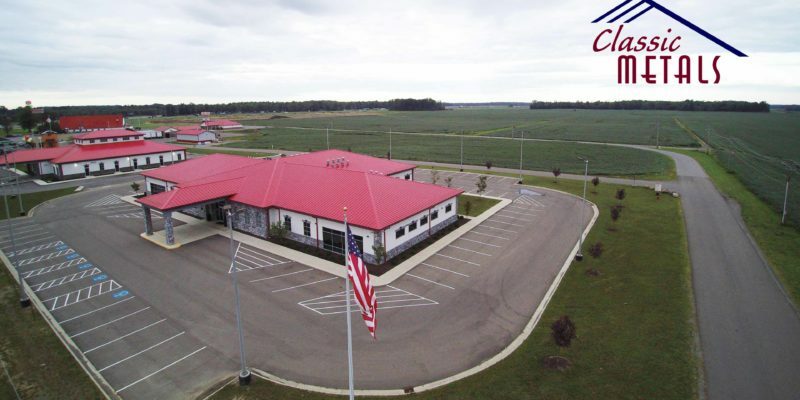 If you are looking for high quality dental care in the Marengo area, then Cardinal Family Dental, which is also located in the same building near the intersection of I-71 and SR 61 is the place to go. Dr. Lenz and Dr. Meers will treat you like family, and are on the cutting edge when it comes to Dental treatments and procedures. From exams and cleanings, to root canals or extractions, the staff at Cardinal Family Dental will treat you with honest and thoughtful care. 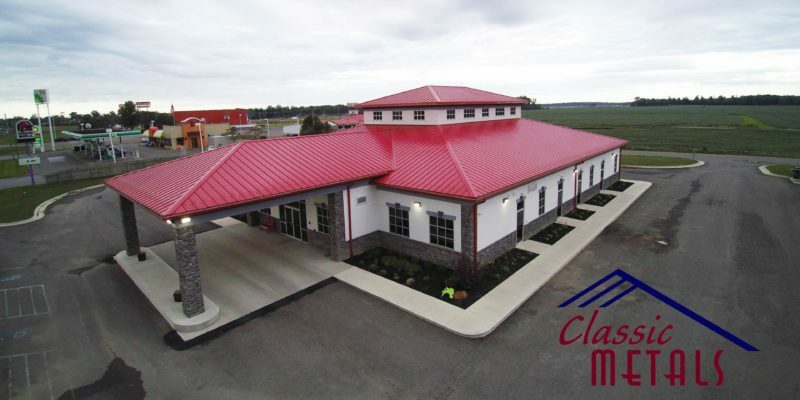 The entire facility has really been a asset to the area, and Classic Metals is proud to have played a part in the construction and completion of this project. 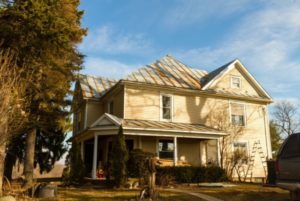 When Gene and Barb Wintersole originally purchased their home, they were not aware that a roof replacement was in their near future, however, there was no way to avoid it. 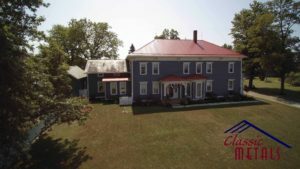 Several years after purchasing the home, they realized that the asphalt shingles were deteriorating fast, after being installed for less than 12 years. 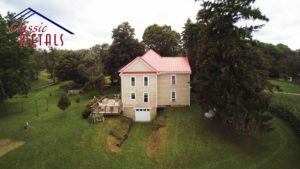 They attempted to contact the shingle manufacturer for a warranty claim, but were told that because they were not the original owners, the roof was no longer under warranty. 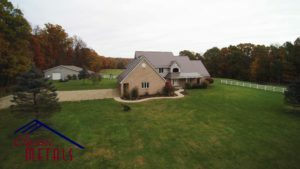 As they considered the roofing options that were available, they made contact with Aaron from Quality Roofing, a roofing installer from Big Prairie Ohio. 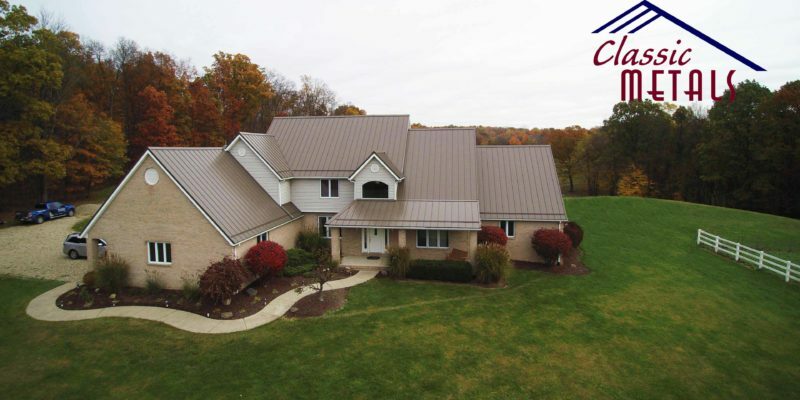 Aaron explained the advantages of a Standing Seam metal roof and the decision was made to install the 16″ Weatherlock Panel in 26 Gauge Slate Gray. The installation went great, and they were very pleased with the final product. Gene informed me that almost everyone on their block has had to replace their roof since they have lived there. Some of the neighbors have replaced their roofs with asphalt shingles, but it just does not make sense to install a asphalt shingle, and have it only last for 12 years. 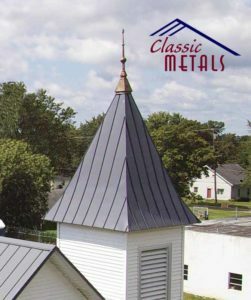 If you look at the big picture, in the long run a metal roof is far cheaper. One of the things that Gene does currently to stay busy is to take photo’s of the surrounding Amish community, and a number of his photo’s have been used in magazines and newspapers. You can view some of the photo’s that he has taken at www.eightlake.smugmug.com. We appreciate the opportunity to work with Gene and Barb in order to make the roof on their home, the LAST thing that they need to worry about. 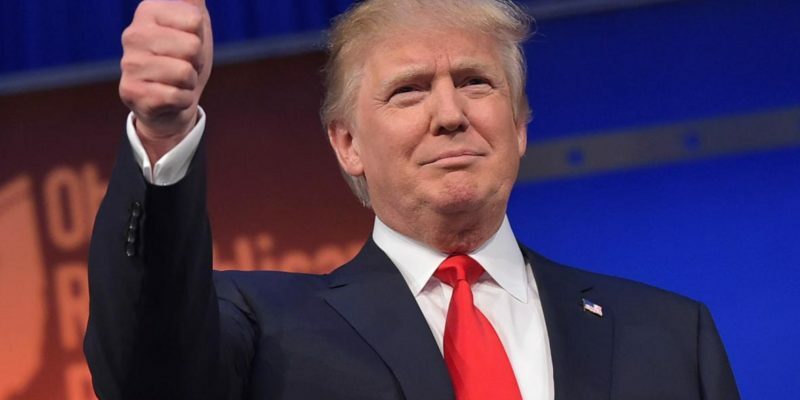 President Donald Trump has pledged to end Steel Dumping in the United States, using both quotas and tariffs according to a transcript that was released July 13th. “Steel is a big problem. Steel is–I mean, they’re dumping steel. Not only China, but others. We’re like a dumping ground, OK? They’re dumping steel and destroying our steel industry, they’ve been doing it for decades, and I’m stopping it. It’ll stop”, he told reporters on Air Force One on July 12th. In 1947—23 nations signed the General Agreement on Tariffs and Trade (GATT), which in 1995 became The World Trade Organization, now with a roster of 163 countries. With the rest of the world’s major economies reeling from the destruction of WWII, American participation in GATT was both an act of generosity and of self-interest: We needed a recovered world with which to trade. To get agreement on GATT, the drafters had to include an escape clause: If imports threaten national security, the importing country can levy super-high tariffs on those products. In the United States, Section 232 of the deceptively named Trade Expansion Act of 1962 allows the president to initiate an investigation to determine whether our security is indeed threatened by imports, which threat can include “substantial unemployment … decrease in government revenue … displacement of any domestic products by excessive imports,” among other impacts. This broad definition of a threat makes the policy options virtually unlimited. President Trump has instructed U.S. Department of Commerce Secretary Wilber Ross to compile a report showing whether steel imports trigger Section 232. This report is due within a week. What will happen if Section 232 is implemented. No-one knows what President Trump will do, if the report shows that Section 232 can be implemented. He has talked in the past of placing a 20% tariff on for steel, however that would be very drastic. 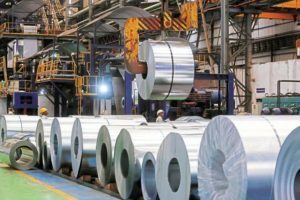 There is no doubt that if large tariffs or quota’s are placed on steel imports across the board, there will be a shortage of raw steel and the cost of steel products will rise. Here are a few quotes by people that are involved in the steel industry. • Domestic steel mills will have less competition so their prices will increase. In turn, this will make the finished goods product that we produce more expensive than the same part being imported from China. Buyers will buy the less expensive product made in China and we will lose jobs. • If Section 232 passes, domestics will follow with a round of large increases and it will send our industry into a self-made recession because people will stop buying and put projects on hold. • It will force 100 percent dependency on domestic Galvalume coil. At Classic Metals we will be watching closely what will happen regarding Section 232, and will be sure to inform everyone if we foresee long lasting effects because of this ruling. Feel free to give us a call if you have any questions. When Rita Boyd began the process of building her new home, there were a number of things that were very important to her during the planing stages. One of the things that was important, was that the home would be built in such a way, that it would be as maintenance free as possible. When the time came to decide on a roofing material, there were several options to consider. 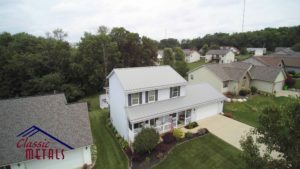 Asphalt shingles would have been an easy choice, however, as Rita thought about it, she realized that asphalt shingles did not fit into the goal of reducing the maintenance that would be required in the future. 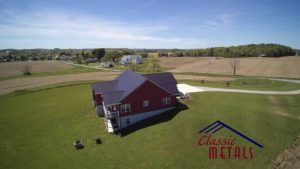 In a previous home, Rita had the experience of needing to replace old asphalt shingles and had decided at that point to have a metal roof installed. 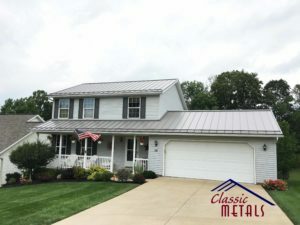 She really liked how it had looked and had a good overall experience, so she decided to look at the options that Metal Roofing would provide on her new home. She was aware of the Ag Panel option, but did not feel comfortable with having exposed fasteners. Metal Shingles would have been really nice, but she was afraid that it would be out of her price range. 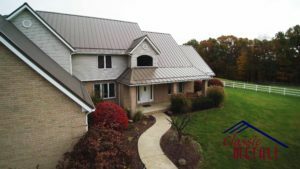 After looking at the different Standing Seam profiles and colors, she decided to go with 24 gauge Matte Black, and the 1″ x 16″ Weatherlock panel. The raw steel was painted and slit by Shefield Metals, and Classic Metals manufactured the panels on the jobsite. Rita mentioned that she was very pleased with the final product. The Standing Seam was some more money up front, but in the long run it really costs less then asphalt shingles. We here at Classic Metals and First Choice Exteriors want to offer our Congratulations on her NEW Home. The black roof accents the red siding very well, and really looks impressive.